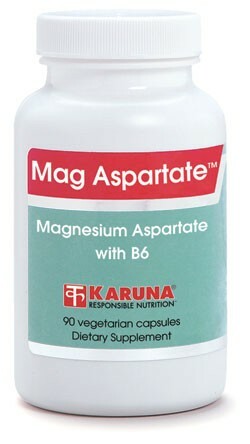 Mag Aspartate offers magnesium fully reacted with aspartic acid to create a true mineral salt in an excipient-free formula free of common food and chemical antigens and allergens. Vitamin B6 is included for its interactions with magnesium. Low magnesium intake is common among women, the elderly, and other patient populations. Clinical trials have found both magnesium and vitamin B6 supplements helpful for diverse conditions, such as reducing calcium oxalate formation in the urine that may disturb normal kidney function, stabilizing premenstrual physiology, and supporting healthy respiratory function. Refer to About...Aspartate Salts and Magnesium. Clinical trials have found both magnesium and vitamin B6 supplements helpful for diverse conditions, such as reducing calcium oxalate formation in the urine that may disturb normal kidney function (J Urol 1974;112:509-12; Am J Clin Nutr 1967;20:393-9), stabilizing premenstrual physiology (J Womens Health 1998;7:1157-65; Br J Obstet Gynaecol 1990;97:847-52), and supporting healthy respiratory function (Am J Clin Nutr 1985; 41:684-8; Magnesium-Bulletin 1997;19:4-6). Suggested use for adults: 3-6 capsules daily taken with meals, or as directed.